Community Harvest is a weekly hot meal program offering food and fellowship to the people of Milton and the surrounding communities. All are welcome to attend regardless of age, income, or religious affiliation. Donations are gladly accepted help us cover the cost of food. 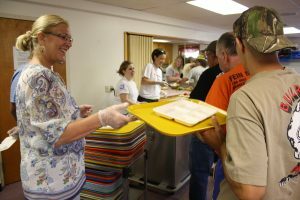 Who: A dedicated team of volunteers from Bucknell University and the local community work to transform the church’s gym into a massive dining room and prepare a balanced nutritious meal for patrons. How: The average weekly cost of a meal at Community Harvest is $300, to feed all patrons which is about $2/per person. Support for Community Harvest comes from Bucknell University, St. Andrew’s Church, Parkhurst Dining Services as well as private donations. Weis Market in Lewisburg also donates baked goods for our meal.